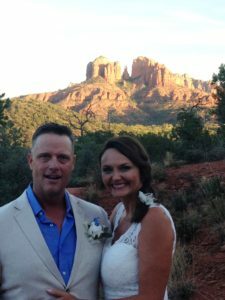 Being a wedding officiant in Sedona is a great job, and I love it! Last week, I got to do my job for Karen and Curtis on one of my favorite hiking trails here — Pyramid Mountain. Karen and Curtis had come in from the Dallas area, and had spent the previous day scouting red rock locations. We have a lot to choose from! After an inspiring yet tiring day, they picked a spot on this trail with wonderful views of Sedona’s iconic Cathedral Rock. Karen’s parents, who live in Mesa, Arizona, attended the ceremony, and handled photography duties. After the ceremony, they shared champagne with us. It was a beautiful, warm Fall evening, with the low western sun lighting up Cathedral Rock and giving it an almost orange glow. Did I say I love my job?